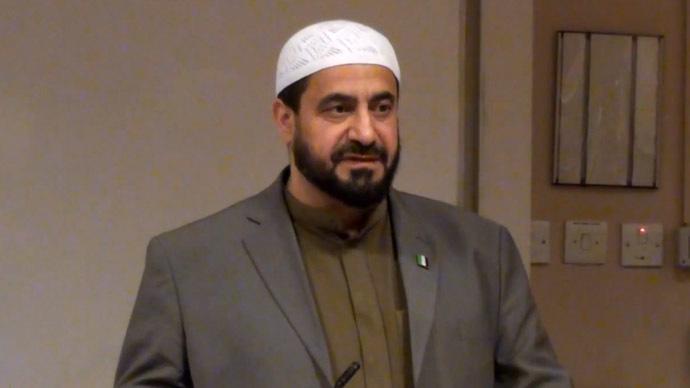 The Metropolitan Police have opened an investigation after a former imam at a west London mosque who was an outspoken critic of Syrian president Bashar Assad was found shot dead. The man was named by local media as Syrian-born Abdul Hadi Arwani, formerly an imam at An-noor mosque. He was discovered sitting in a dark-colored Volkswagen Passat with gunshot wounds on Tuesday morning in Greenhill, Wembley, in northern London after police responded to reports of a shooting. A police source told the MailOnline on Wednesday morning that the killing had the hallmarks of a "state-sponsored assassination." Police have said a post-mortem examination will take place and have opened an investigation into the death of the former imam, who is believed to have had six children. In 2012, during that year’s Syria Crisis Week, Arwani spoke about growing up under the Assad family regime. He said he was forced to flee Syria after he was sentenced to death for taking photos during the aftermath of the 1982 Hama massacre. The London College for Islamic Studies confirmed that Arwani studied in Jordan for three years before moving to the UK. He is reported to have studied in the Sharia law faculty and was considered a marriage and divorce expert. Arwani was a popular figure in his community and tributes to the former imam flooded social media throughout Tuesday.